What more does anyone need other than Love and espresso’s? This beautiful set of four espresso cups are all hand inlaid with the word “Love” in vibrant hues of lilac, blue, red and green. Each espresso holds 100ml’s of Love! Need a daily shot of Love? This beautiful set of four Keith Brymer Jones espresso cups are beautifully crafted from the finest super white porcelain. 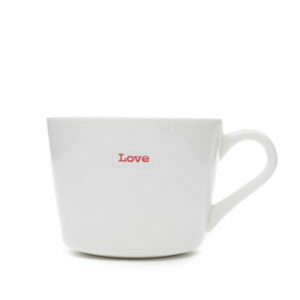 Each of the cups are inlaid with a different colour of the word “Love”. Keith Brymer Jones has been designing the Word Range for the past 30 years. Keith began his career as a production potter where he would throw up to 1,000 pots a day for high-street brands such as Conran and Habitat. Keith is now head of design at MAKE International, designing ceramic ranges which are perfect in every home. 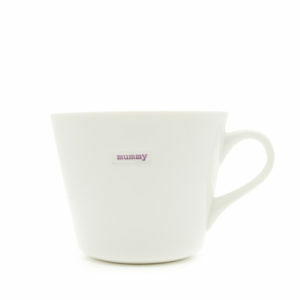 Each espresso cup has a capacity of 100ml’s and is microwave and dishwasher safe.